Wooden bridges and walkways are popular in gardens that have small streams or where the garden necessitates a walkway in order to get from one place to another. Instead of allowing a path to form from wear on the grass you can install a 1m or so wide walkway which is level and flat allowing you to move from one side to the other in comfort. They are often complimented by stairs or the occasional step up or down where the ground falls. They are often used to join one deck to another or a doorway to a deck. Bridges can be spanned quite far without using supporting posts if balau is used. If posts are needed to support the bridge midway then H5 CCA treated posts can be used which can live in water for up to 30 years. Please complete the form below if you require a quote and I will contact you or you can call on 031 – 762 1795. 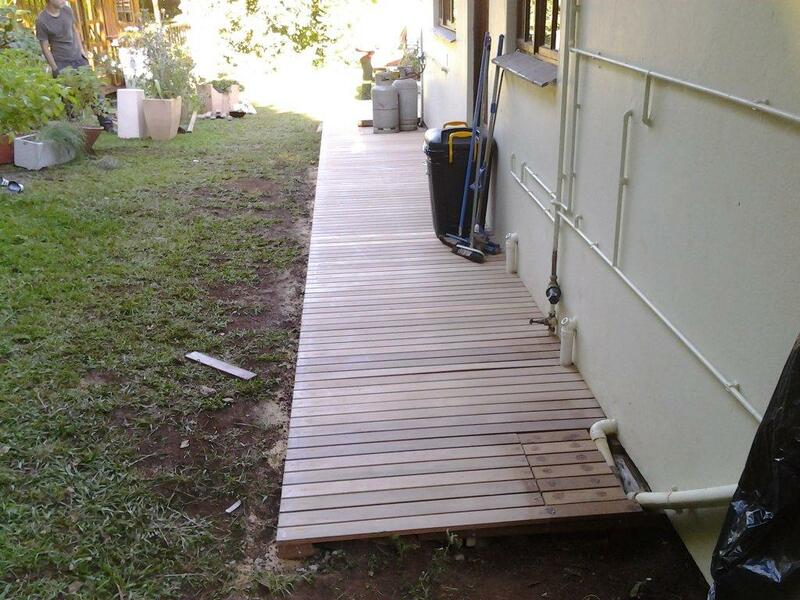 This entry was posted in Bälau, Bridges and tagged Bälau, Bridges, CCA Treated, decks, Durban, kwa zulu natal, kzn, timber, walkways, wood, wooden, Wooden Decks by Erin. Bookmark the permalink.